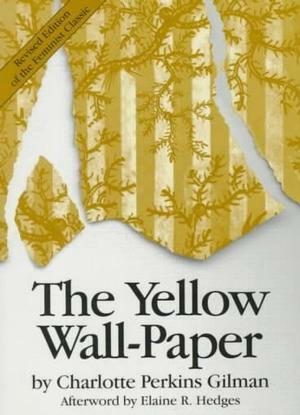 The Yellow Wallpaper" (original title: "The Yellow Wall-paper. A Story") is a 6,000-word short story by the American writer Charlotte Perkins Gilman, first published in January 1892 in The New England Magazine. It is regarded as an important early work of American feminist literature, illustrating attitudes in the 19th century toward women's health, both physical and mental. Presented in the first person, the story is a collection of journal entries written by a woman whose physician husband (John) has rented an old mansion for the summer. Foregoing other rooms in the house, the couple moves into the upstairs nursery. As a form of treatment she is forbidden from working, and is encouraged to eat well and get plenty of exercise and air, so she can recuperate from what he calls a "temporary nervous depression – a slight hysterical tendency", a diagnosis common to women in that period. She hides her journal from her husband and his sister the housekeeper, fearful of being reproached for overworking herself. The room's windows are barred to prevent children from climbing through them, and there is a gate across the top of the stairs, though she and her husband have access to the rest of the house and its adjoining estate. The story depicts the effect of understimulation on the narrator's mental health and her descent into psychosis. With nothing to stimulate her, she becomes obsessed by the pattern and color of the wallpaper. "It is the strangest yellow, that wall-paper! It makes me think of all the yellow things I ever saw – not beautiful ones like buttercups, but old foul, bad yellow things. But there is something else about that paper – the smell! ... The only thing I can think of that it is like is the color of the paper! A yellow smell.